A land value tax (or site valuation tax) is an ad valorem tax on the unimproved value of land that, unlike typical property taxes, disregards the value of buildings, personal property and other improvements. Although the economic efficiency of a land value tax (LVT) has been established knowledge since Adam Smith, it was perhaps most famously promoted by Henry George. In his best selling work Progress and Poverty (1879), George argued that when the site or location value of land was improved by public works, its economic rent was the most logical source of public revenue. A land value tax is also a progressive tax, in that more tax burden would fall on wealthy landowners than on the landless poor. The philosophy that land rents extracted from nature should be captured by society and used to replace taxes is often known as Georgism. George believed there was an important distinction between common and collective property. Land value taxation is currently implemented throughout Denmark, Estonia, Russia, Hong Kong, and Taiwan. The tax has been applied in subregions of Australia (New South Wales), Mexico (Mexicali), and the United States (Pennsylvania). Singapore, and China have something similar to an LVT in that the government owns most of the land and leases it out, but the buildings on the land are owned separately as private property. This is equivalent to an LVT except that the “tax” is called a “rent” that is charged by the government. According to Georgists, a land value tax can be considered a user fee instead of a tax, since it is related to the market value of socially created locational advantage, the privilege to exclude others from locations. The land value of the site is also directly related to its demandable ground-rent, which is its potential for use in either production or residential capacities. The capitalization of this rent gives the land value too. Land which is not useful has no value as explained by British economist David Ricardo in 1816. 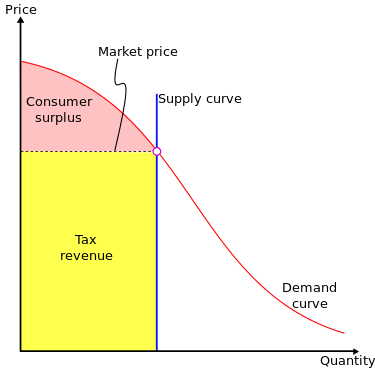 If the supply of land is fixed, the burden of the tax will fall entirely on the land owner, with no deadweight loss because a LVT will not deter production nor distort market mechanisms the way most other taxes do. Landlords are unable to pass the tax on to tenants, because the supply and demand of rented land is unchanged. Because the supply of land is perfectly inelastic, land rents depend on what tenants are prepared to pay, rather than on the expenses of landlords, and so LVT cannot be passed on to tenants. Most taxes distort economic decisions. For example, a property tax dis-incentivizes landowners from improving their land because improvements would increase their taxes. This encourages landlords to be slumlords in order to keep property taxes low and it encourages the proliferation of vacant lots because speculators can afford to waste land resources when property taxes on vacant lots are very low. LVT is payable regardless of whether or how well the land is actually used, so the owner of a vacant lot would pay the same LVT as a neighbor with the same size lot who built a shiny new apartment building. The LVT incentivizes owners to maximize the productivity of their land. Libertarian economists Milton Friedman and Fred Foldvary, have argued that the necessity to pay the tax encourages landowners to develop vacant and underused land properly or to make way for others who will. They state that because LVT deters speculative land holding, dilapidated inner city areas are returned to productive use, reducing the pressure to build on undeveloped sites and so reducing urban sprawl. Landlords normally lobby for government services that improve their own neighborhoods because when local amenities improve, landlords can reap all the financial benefits by raising rents. Under a LVT, there is less concentrated incentive to lobby for local government projects because wealthy landlords don’t immediately reap an unearned increment in wealth from better roads, parks, and local government services. Under a LVT, residents living near the improvements to the surroundings would still benefit, but the additional revenues generated by greater local housing demand (higher rent) would go to the government to pay for the amenities rather than to absentee landlords who did nothing to deserve the benefits. Real estate bubbles direct savings towards rent seeking activities rather than other investments, and can cause recessions (such as in 2008) which damage the entire economy. Advocates of the land tax claim that it reduces the speculative element in land pricing, thereby leaving more money for productive capital investment and making the economy more stable. Land value would be reduced to zero or near zero and owners would only pay for the value of improvements like buildings. Thus, privately held wealth would decline as the land value element was stripped out. Since landowners possess significant political influence, this has been the main deterrent of the adoption of land value taxes. Billed to the correct person or business. In theory, levying a land value tax is straightforward, requiring only a valuation of the land and a register of the identities of the landholders. There is no need for the tax payers to deal with complicated forms or to give up personal information as with an income tax. Because land cannot be hidden, removed to a tax haven or concealed in an electronic data system, the tax cannot be evaded. Critics argue that precisely determining land value can be difficult in practice. Libertarian Murray Rothbard objected stating that no government can fairly assess value, which can only be determined by a free market. However, this isn’t a major impediment because land-value appraisal techniques have dramatically improved since Rothbard’s day due to modern computerization and statistical techniques like multivariate regression analysis and geographic information system (GIS) in the 1960s and 1970s. Firstly, free market businesses are already determining the value of land. For example, valuators in the home insurance industry are already performing such a function on a daily basis when, in order to calculate an insurance premium, the valuator must separate the value of the home from the indestructible value of the land beneath the home itself using market evidence from selling prices and rentals. Secondly, governments are also already estimating the value of land as part of the process of assessing real estate taxes and the same process can be used to assess land value via the residual method: the value of the site is the total value of the property minus the depreciated value of buildings and other structures. When compared to modern day real estate tax evaluations, valuations of land involve fewer variables and have smoother gradients than valuations that include improvements. This is due to greater variation of building style, quality and size between lots. The quality of the land itself is much less variable. Furthermore, even if land value were harder to estimate than the real estate value that we are currently taxing (which is dubious), it is better to attempt the theoretically correct tax and estimate it with a little more error than implement a worse tax with more accuracy. Some LVT supporters are utopians who hope to replace all taxation with this single tax, but a LVT alone may not be able to raise large enough revenues. LVT enthusiasts argue that this analysis ignores the fact that other taxes reduce land values and hence the amount of revenue that can be raised from them. For example, the Physiocrats argued that all taxes are ultimately at the expense of land rental values. The critique that an LVT produces limited revenue that cannot replace all other taxation is solely aimed at these utopian LVT supporters, but most modern LVT systems have merely been implemented to replace property taxes while maintaining or only partially reducing all other taxes. In the above case, land is taxed at 100% of its rental value, eliminating the landowner surplus completely. If land value were overestimated, a tax that is greater than the land value would then begin to fall upon the improvements on the land which would make it more like property taxes. As a worst-case scenario, if land tax revenues are raised beyond the value of the property it would result in landowner abandonment and a sharp decline in tax revenue. Some people argue that there would be disastrously widespread abandonment of land if the LVT were aimed at taxing the full value of land, but this is mistaken. Firstly, the LVT would not tax private capital improvements to the land, and most land has some sort of capital improvement that will continue to have positive value. For example, when there are buildings on land, they are usually worth much more than the land itself and the buildings are sold with the land. Secondly, even with our current real estate taxation system, real estate is sometimes abandoned, and there isn’t any evidence that this problem is worse under existing LVT regimes. For example, Harrisburg, Pennsylvania has taxed land at a rate six times that on improvements since 1975, and this policy has been credited with reducing the number of vacant structures in downtown Harrisburg from around 4,200 in 1982 to fewer than 500. More vacant lots should be abandoned when LVT replaces real estate taxation, but land with structures should be abandoned less. By ceasing to tax structures and solely taxing the land, we should see fewer abandoned buildings and that would be a big improvement even if there is an increase in the abandonment of vacant lots. Each abandoned building costs its community thousands of dollars in increased crime (because criminals such as drug dealers often settle in them), disease (rats & other pests settle in them) and demolition costs (because abandoned buildings typically deteriorate rapidly and become uninhabitable whereupon the government must demolished them at a cost or thousands of dollars). Abandoned vacant lots cost almost nothing and can be more quickly re-sold at auction to determine the maximal LVT that the land can bear under the current market conditions. In some countries, LVT would be nearly impossible to implement because of lack of certainty regarding land titles and clearly established land ownership and tenure. For instance a parcel of grazing land may be communally owned by the inhabitants of a nearby village and administered by the village elders. In these situations, the land in question would need to be vested in a trust or similar body for taxation purposes. This kind of cooperative-owned land is already common practice in Latin America and parts of Asia where the cooperatives could pay the tax. If the government cannot accurately define ownership boundaries and ascertain the owners, it cannot know from whom to collect the tax. The phenomenon of lack of clear titles is found worldwide in developing countries and is a focus of the work of Hernando de Soto. Many developing countries have poorly surveyed land boundaries and much land ownership that is not legally determined because of lack of registration which leads to economic inefficiency because there isn’t any incentive to invest in land improvements nor ability to borrow using land as collateral. Proponents of LVT argue that it will help produce clearer land ownership because elusive landlords would simply lose ownership of the land if taxes are not paid. As a model of how Land Value Taxation affects incentives, take for example a vacant lot in the center of a vibrant and growing city. Any landowner that must pay a tax for such a lot will perceive holding it vacant as a financial liability instead of an investment that passively rises in value. A LVT does not increase the purchasing price of land. Tax incidence rests completely upon landlords. This is to say that landlords can not collectively raise the overall market price of land as a result of the tax. Buyers will not pay for the anticipated appreciation of land since such appreciation is taxed away. From the seller’s perspective, land costs more to continuously maintain ownership of. Thus, Land Value Taxation gives buyers of unused/underused parcels in central locations increased leverage over sellers who would use it productively. Similarly, the selling price of anything that is fixed in supply will not increase if it is taxed. Since there is, for all intents and purposes, a fixed supply of land, a land value tax is paid by the land owner. 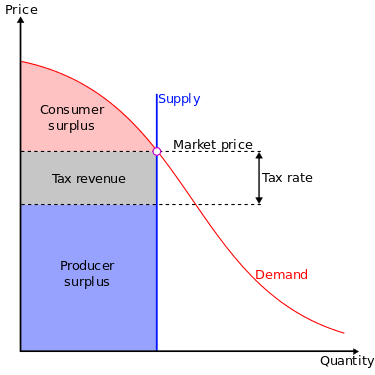 Furthermore, unlike taxing goods that carry higher purchasing prices as a result of higher production costs, land does not increase in price when taxed. This is because land simply exists. It is not produced by individual land owners. For these same reasons, a land value tax is also not passed on to tenants as higher rent. Landlords are impelled to make land available to tenants as a means of generating the funds required to pay the Land Value Tax. Relatively speaking, landlords compete with other landlords for tenants instead of tenants competing with each other for space. Land Value Taxation creates an impetus to either use a site for an income generating purpose, such as apartments, store fronts, office space, etc. or to sell part or all of the site. Of course, anyone who purchases the land will be faced with the same incentive, which is to use it or lose money. The Land Value Tax paid per surface area is high in locations with high land values, especially cities. In vibrant cities, under use of land in the form of buildings which are underused, short, or even derelict are generally speaking converted to more intensive uses. Of course vacant or ground-level parking lots are also generally converted to building space and parking structures. For example, the above image shows some of the vast vacant lots near my former home in Chicago with the Willis Tower (aka Sears Tower) in the background. This land has high value because of its location near the expensive condos and skyscrapers in the background, but it sits vacant because of speculators who are waiting for its value to rise and the property taxes are based more on the structures than on the land. If Chicago taxes were based upon land value rather than the structures, then the taxes on this land would be about the same as the taxes on the condominiums in the background. That would encourage the owners to sell it to someone who can make it productive rather than hoarding the land for speculation. The real estate tax on vacant lots it cheap compared with the condominiums and skyscrapers in the background because most of the property value that is taxed is in the high-rise buildings rather than in the land. A LVT gives more incentive to use land rather than hoarding it for speculation. That would increase the supply of space for living, working, recreation, etc. Assuming constant demand, an increase in supply of constructed living space (a substitute for land), would decrease the rents for living space. The LVT would replace taxes on buildings that are a large component of real estate tax. Taxes on buildings restrict the supply of building space. A revenue neutral shift from buildings to land increases the supply of building space. Taxing land reduces the incentive for tax evasion. Multi-national corporations for instance cannot take land with them overseas. Land values are considered public information unlike income, sales, etc. GIS maps provide a means to easily compare taxes paid on land values. Such transparency reduces landowners’ ability to evade the tax. Transportation investments often increase nearby land values. This can choke off development, pushing new growth to cheaper sites remote from these investments. This “leapfrog” development creates a demand for infrastructure extension that starts the process over again. Transportation infrastructure, intended to facilitate development, thus chases it away. Resulting sprawl strains the transportation, fiscal, and environmental systems upon which communities rely. …[An LVT would reduce] the tax rate on assessed building values and increase the tax rate on assessed land values. The resulting compact development should facilitate better transportation and accommodate economic growth with reduced fiscal and environmental costs. LVT is an ecotax because it discourages the waste of locations, which are a finite natural resource. From a secular point of view, land acquires a scarcity value owing to the competing needs of the community for living, working and leisure space. According to proponents, the unimproved value of land owes nothing to the individual efforts of the landowner and everything to the community at large. These supporters suggest that the value of land belongs justly and uniquely to the community. The primary secular ethical justification for LVT is that it is both more efficient and more equitable than any alternatives. A land value tax takes into account the effect on land value of location, or of improvements made to neighbouring land, such as proximity to roads, public works or a shopping complex. LVT is said to act as value capture tax. A new public works project like a new park or subway station may make adjacent land go up considerably in value, and thus, with a tax on land values, the tax on adjacent land goes up. Thus, the new public improvements would be paid for by those most benefited by the new public improvements — those whose land value went up most. Thus, a land value tax would tax wealth that is created by government, allowing a reduction in tax on privately created wealth. Additionally, a land value tax is also a progressive tax, in that the tax burden is entirely based on land ownership, which is highly correlated to wealth, and there is no means by which landlords can shift the tax burden onto tenants or laborers. Thus it would be paid for by those with a higher ability to pay, and reduce the tax burden of lower income families. Land value capture would reduce economic inequality, increase wages, remove incentives to misuse real estate, and reduce the vulnerability that economies face from property bubbles. The problem of gentrification is that when a neighborhood becomes a more desirable place to live, the property values rise and rich people move in, displacing less-affluent long-term residents. The only two ways to combat this problem is to 1. prevent a neighborhood from becoming a nice place to live, or 2. to build more housing in nice places to make room for both affluent newcomers and the less-affluent long-term residents. A land value tax would help reduce the problems of gentrification by hitting both issues. First, it makes elite neighborhoods less desirable by taxing away the benefits of living in areas with more amenities. In theory, all neighborhoods would be equally desirable for purchasers if an LVT were implemented optimally and all purchasers had the same demand function. The rents in more desirable places would still be higher than in less desirable places, so there would still be some gentrification, but it would be less due to the fact that speculators would no longer have any incentive to congregate in fashionable neighborhoods and try to reap the profits of driving up property values. Secondly, an LVT encourages developers to build more housing. Bad zoning laws may be the bigger cause of problems with constraints on the supply of housing, but an LVT would still help. Karl Marx opposed the LVT because he was worried that it would help to preserve capitalism by making capitalism work better. He was undoubtedly right about that. Wikipedia’s entry on Land Value Tax also contains a history of the concept and many more examples of implementation. Wikipedia’s entry on Georgism: LVT is almost synonymous with Georgism, but each Wikipedia entry has slightly different information. For example, this one lists additional proponents and opponents.